The first stop on my cider odyssey is Herefordshire (English pn: HAIR-eh ford sheer) which, for those of you who don't have your Engliah counties memorized, is the the west, snuggled up next to Wales. Among cider nerds, Somerset is often invoked as the mystical center of English cider-making, but Herefordshire probably has more claim. This is the home of the famous cider pioneer, Bulmers, which is now generally spat out as an insult. It wasn't always the case, though, that the world's first industrial cider-maker was associated with lowbrow stuff. And it's not incidental that the Bulmers got their start in Herefordshire: this is where the apples are. It's also where a number of the most-respected small-production cider makers work their craft. I have spent the last two days with two of them: Mike Johnson of Ross-on-Wye ciders (where, word to the wise, a B&B is located, just steps from the cider cellar, where Mike will pour you a taste or fourteen), and Tom Oliver of Oliver's Cider and Perry. As with any craft, cider makers each have a philosophy. I wondered, before arriving: do they tend to clump together philosophically, like the alt brewers of Dusseldorf and lambic brewers of Brussels? My sample size is too small to count as definitive, but it was interesting to find real philosophical similarities between the two men. Both make their ciders naturally, which is to say without adding yeast, and left to ferment naturally in ambient outside temperatures. (That means the apples that come to press in September star fermenting warmer than those that linger til December.) Both eschew technical fussiness--when I asked questions like "what's the pH?" Tom gave me a wide range with a shrug and both said they don't really care. The cider takes care of itself, they believe. Both also make and are committed to perry (fermented pear juice). And perhaps most tellingly, both use the word "soft" a lot. English cider comes largely from bittersweet apples. The bitterness comes from tannins, which can be quite aggressive. (Their individual flavors are as varied as hops--some woody, others spicy, others tea-like and so on.) Neither man likes them to have a harsh edge, and throughout the process they do things to sand them down to a smooth, supple bitterness. Tannins are more pronounced in young fruit, so they wait until it's very ripe--they fear green apples more than rot--and sometimes let the apples sit awhile. Very slow natural fermentation (six weeks to six months) helps preserve flavors; chemical reactions are slow and the subtle aromatics aren't blown out by roiling carbonation from the kind of vigorous fermentation you see in beer. Then the ciders rest, and this seems to be the most important part. Depending on the variety, they may condition up to two years. Tom also encourages malolactic fermentation, which further softens things. The effect is most obvious in the dry still ciders they make. They are bone dry--gravities as low as 0.998. You'd imagine the lack of sugar and those tannins would create a very sharp, intense cider, but that's not the case. So much of the subtle flavor and aroma compounds remain that the palate is fooled into thinking some of the fruit notes are sweet. The bitterness becomes integrated with those flavors and is often so "soft" you don't realize how many tannins there are until that lip-smacking astringency alerts you after your swallow. The other thing that really struck me--and this is partly because I'm a beer guy--is how much Mike and Tom follow their cider's lead. In brewing, you want as much control over the process as you can get. In Hereford, they let circumstances guide them. The apple harvest is unpredictable and they work with the fruit they have. 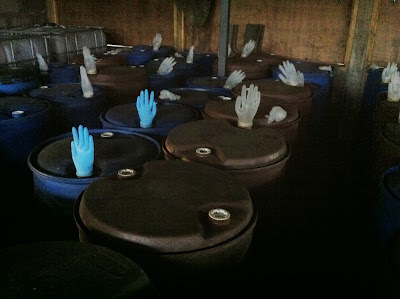 Since they ferment naturally, they work with the ambient temperatures around them. 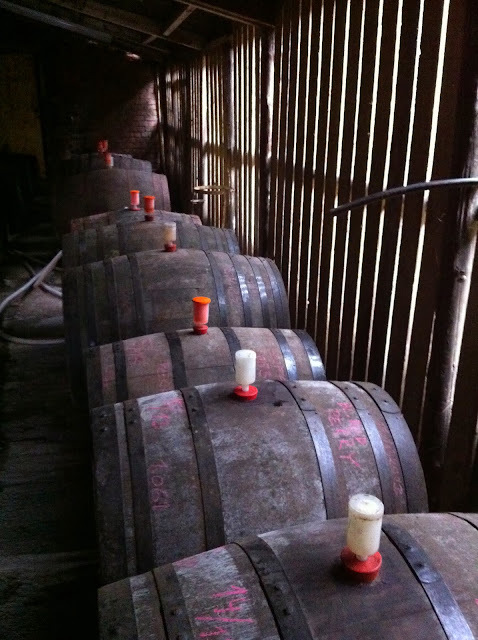 They take gravity readings, but they also just watch to monitor fermentation. And the cider is ready when it's ready. 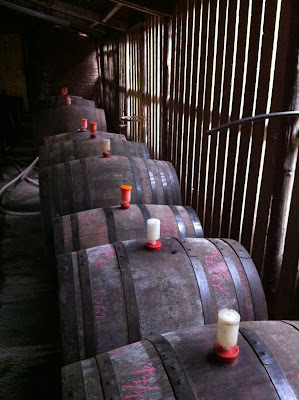 They taste as they go along, waiting for all those variable to line up to give them soft, complex ciders. 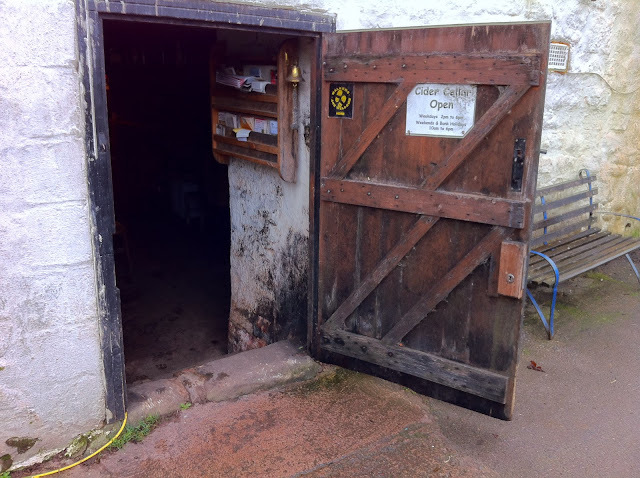 Photos (from top): (1) Tom Oliver's barrels, in what was formerly a building devoted to processing hops; (2) the cider cellar at Ross-on-Wye; (3) when the ghostly hands deflate, the cider has stopped fermenting.